Poly Finish | Pro Chem, Inc.
POLY FINISH is a metal-crosslink, modified acrylic floor finish that is designed to retain its glossy finish under even the most severe traffic and maintenance conditions. It defies water spills, detergents, scuffs marks, heel marks and provides exceptional slip resistance in all areas. 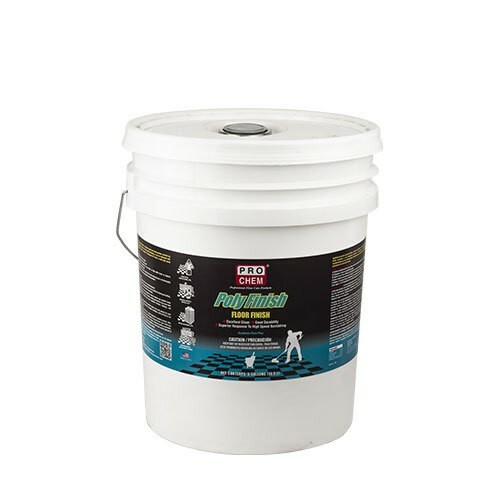 Extremely economical covering between 1500 and 2000 square feet per gallon. POLY FINISH readily rebuffs. Thoroughly strip floor with a stripper. Rinse floor thoroughly with clean water. Apply a sealer base (optional) to worn floors or high traffic floors to improve wear-resistance and enhance gloss. Apply 2-4 coats of floor finish in uniform thin coats, allowing time to dry thoroughly between coats. Allow for longer drying time in damp weather.